Queenstown is buzzing after 24 hours of constant snowfalls blanketed the town and surrounding mountains, giving local ski areas a huge boost before the start of the winter season. Destination Queenstown CEO Graham Budd says the fresh snowfall transformed the resort from autumn colours into a winter wonderland “literally overnight”. “We only get snow downtown a few times a year so it’s always a treat for locals and visitors and it makes for some stunning photo opportunities,” he says. Locals and visitors will welcome the start of Queenstown’s winter season on 21 June when the annual American Express Queenstown Winter Festival kicks off with 10 days of fun and frivolity on and off the ski slopes. Dubbed the Southern Hemisphere’s biggest winter celebration, the multi award-winning festival (21-30 June) attracts around 30,000 locals and visitors to celebrate the start of the winter season with live music, fireworks, street parades, comedy, food and wine events, crazy races, quirky entertainment and mountain mayhem. Mr Budd believes Queenstown will be an even more popular short-haul holiday destination for Kiwis and Australians this winter thanks to increased flight scheduling and capacity. “Queenstown is a short flight from New Zealand’s major centres and only three hours from Australia which makes it very accessible for a winter holiday or long weekend. 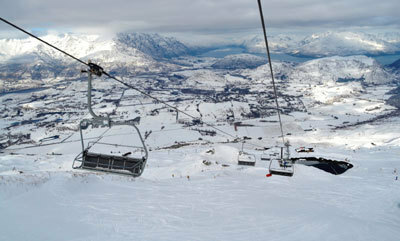 “The skiing is world-class and Queenstown itself also has plenty to do off the slopes whether it be exploring the region’s lake and alpine scenery, ice skating, taking a wine tour, playing golf, indulging in a spa treatment, some retail therapy, or enjoying the buzz of the vibrant après ski atmosphere and busy events calendar. “It really is the ultimate winter holiday destination for all ages. Everyone who has ever aspired to have a winter holiday in Queenstown should make 2013 the year they say ‘we did it’, ” says Mr Budd. For more inspiration, visit queenstownNZ.co.nz.